Main findings: The plants are too young to allow any firm conclusions. 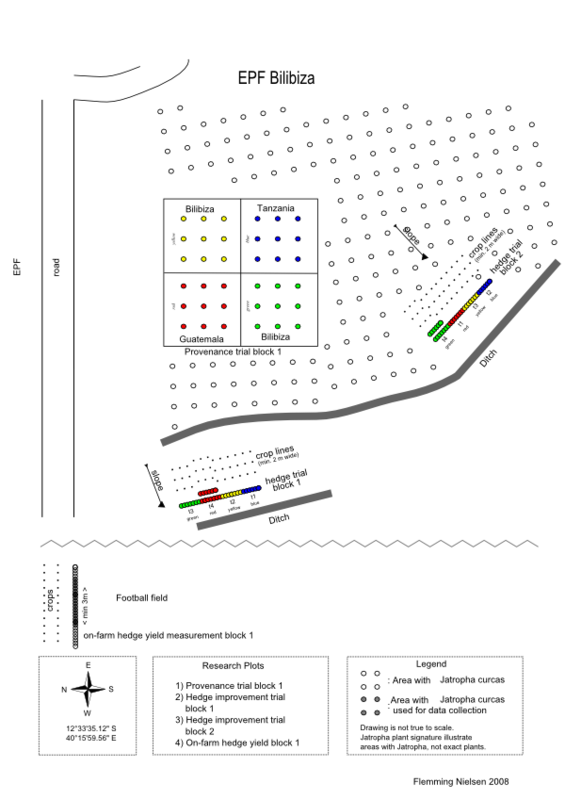 Furthermore the data collection was not of sufficient quality for part of the time and on short reliable data series have thus been obtained so far. 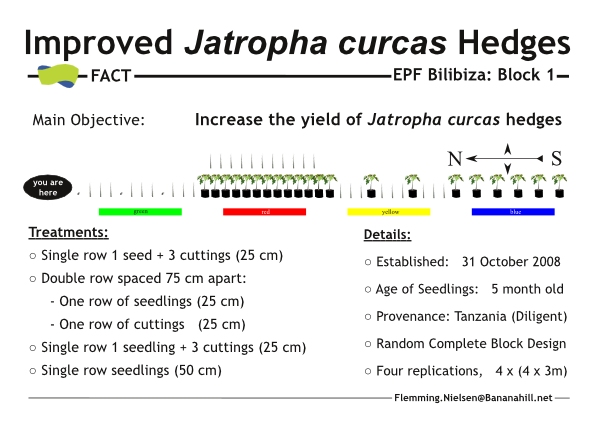 Initially the project focused on small farm plots of Jatropha curcas in mono-cropping. 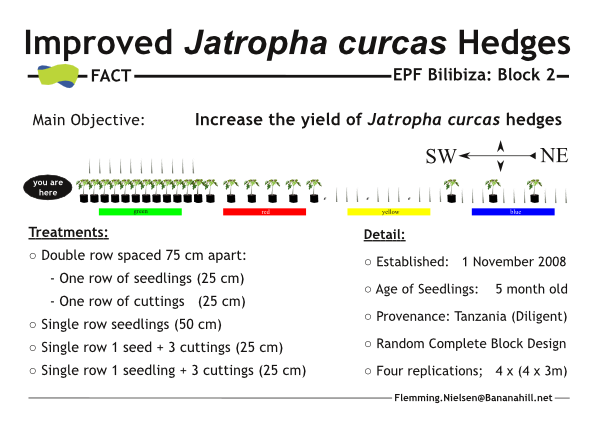 However, with time the focus moved to boundary planting of Jatropha curcas as this is preferred by the farmers. Initially boundary plantings consisted of one row of Jatropha curcas but recently dual rows have become popular. The farmers practice mixed inter-cropping without planting on line or homogeneous crop mix. This makes it difficult to achieve rigorous results from on-farm boundary plantings. More controlled conditions are required. After discussions with the project staff it was felt that the farmers' demonstration plots would be the best location for the trial. A positive side effect is that many farmers can observe it and draw their own conclusions and that it can be part of the training sessions in the Farmers' Clubs. In the demonstration plots it is be easier to keep the crop planted on one side of the hedge uniform and also ensure uniform management of the trial. Because the crops in the trial are not planted and managed in the same ways as farmers do the crop yield in the experiment cannot be assumed to reflect yield in farmers fields'. 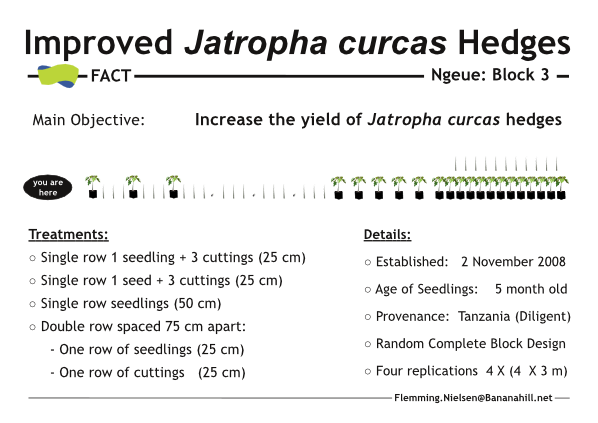 It has been shown that Jatropha can easily be established from seedlings, cuttings and direct seeding. Plants established from cuttings appear to yield seed earlier than any other method. However, because cuttings don't develop tap roots they are susceptible to drought and wind and therefore not preferred. A combination of seedlings or direct seedling with cuttings may be the best way to quickly get yield and still secure good long-term yield. In the literature spacing for hedges are often 15-25 cm. However, in the project area farmers never plant that dense so the closest spacing that is tested is 25 cm. 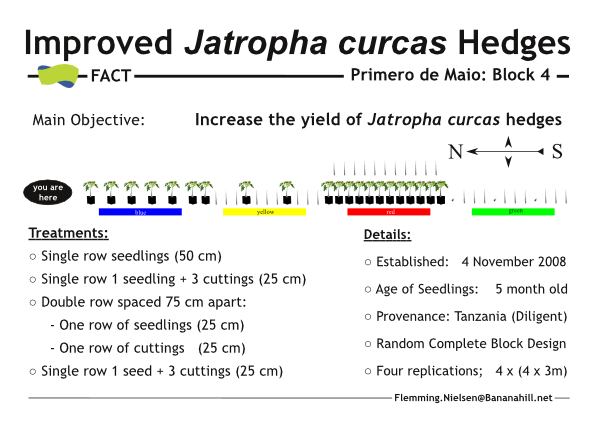 One treatment consists of a single row of Jatropha curcas spaced 50 cm apart. This resembles farmers' practice and is therefore considered the control in the experiment. Single row with planting distance 25 cm consisting of 3 cuttings followed by 1 seedling followed by 3 cuttings etc. Single row with planting distance 25 cm consisting of 3 cuttings followed by 1 plant established from direct seeding followed by 3 cuttings etc. Below is a detailed description of each treatment and the surroundings. The crop in the experiment will be a crop that is grown by the farmers in the area. A rotation of crops will likely be used. 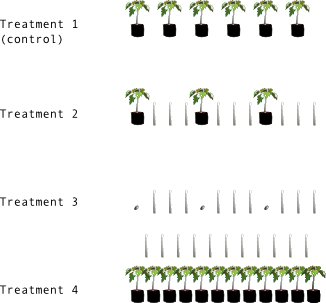 In every season the same crop will be planted uniformly (line planting) throughout each block in a uniform way. Observe that treatment 4 is 75cm wider than the other treatments and that in all cases the distance between the first crop row and the hedge has to be 1.5m. The lines of crops will therefore be interrupted at the double row hedge, e.g. 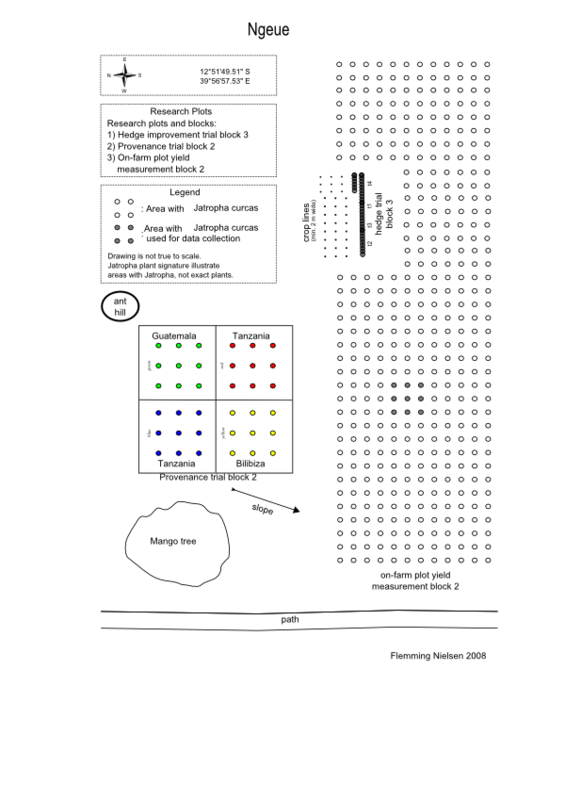 A Randomized Complete Block Design is used. 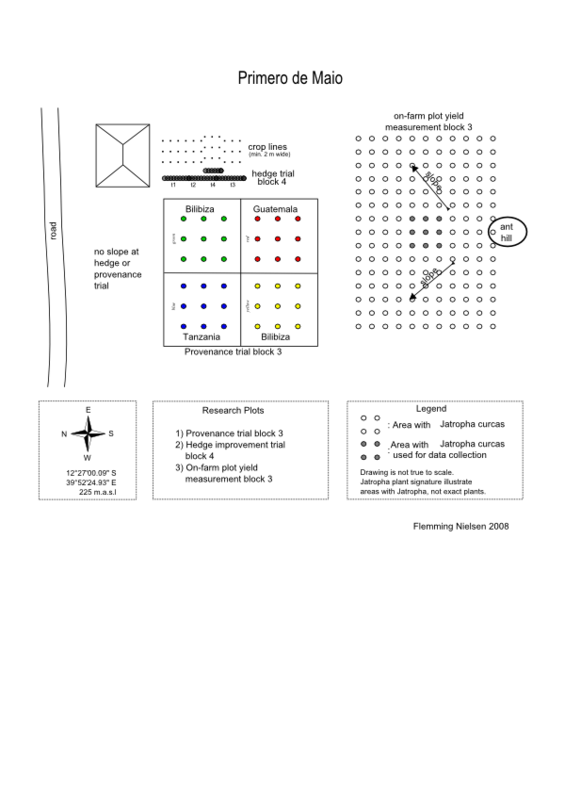 Four blocks have been established. No replanting is done as this is in line with the common practice of farmers in the area. All planting material is of the same origin. The hedges are pruned according to the recommendations from the project. Data is being collected from two meter hedge in each plot, i.e. to avoid border effects the last ca. 50 cm hedge that is bordering the plot is left out of the sampling. The plants that are sampled are marked with coloured strings. Seeds should be collected while still on the plant, i.e. when the fruits are yellow to ensure that sampling is only done from the plants included in the sampling.